Have you ever driven through a thunderstorm so ferocious you could barely see the car in front of you? That was our experience on Saturday April 8 – crawling down the Monash Freeway, steering wheel gripped with white-knuckled concentration. The fact that the plug wasn't pulled on Luminous Streets is a testament to the berserker-like nerve of the team down at Bass Coast's The Edge of Us Small Town Transformation. Lesser event managers might have flinched in the face of such a tempest, but on the coast they know the weather, and knew it would clear. Their resolve was rewarded as the clouds passed, opening up the most brilliant sunset to the west, with distant flashes of retreating lightning to the east. A fitting opening to an event all about light, community, and spectacle – an event called Luminous Streets. Sunset on the Grantville Foreshore. The five waterline townships of Corinella, Coronet Bay, Grantville, Pioneer Bay and Tenby Point have been working tirelessly over the last six months to realise this amazing community arts event. 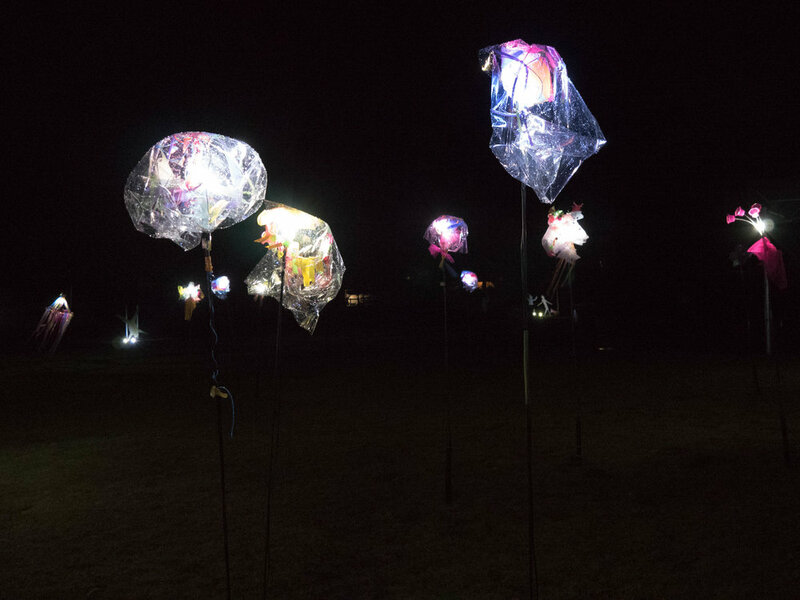 Working with a lead artist, each town has been learning how to create light sculptures out of batteries, LEDs, and a dazzling array of materials and found objects. Working in public spaces throughout the five towns, as well as the Bass Valley Primary School, the lead artists help each community to find a distinct theme and style for their place. Grantville lead artist Andreas Diesner rewires a light-cube on the fly. The work created was diverse and dazzling, filling these public spaces with glittering sculptures that were by turns alien, amusing, and ambitious. Imagine a shoreline reserve suddenly sprung with a glowing forest of household objects including an esky, tupperware, and some very wise paper plates. A forest of light at Coronet Bay. Or a woody point overlooking the ocean infested by glittering creatures – mosquitoes, jellyfish, serpents, and more. Our CEO Joe Toohey and Small Town Transformations Manager Graham Coffey in the clutches of a jellyfish. Despite the rain, crowds of locals and visitors came to each of these wonderful sites, drawn by the art, live music, and hot jam doughnuts. The installations used 200 rechargable batteries, over 800 LED light sources, and 3100 crimped terminals. All in all, over 500 people across the five towns were involved as creators of these light displays and the community pride was not dampened by the weather, with parking spots hard to come by at some installations as people zipped over to their neighbours to explore each other's work. Cubism writ large in Grantville. For me the evening was enchanting and a surprise on many fronts. It was immensely rewarding to see so many people come out despite the weather, and finally understand what we have been trying to do all this time – to see the small pieces that seemed inconsequential combine into a beautiful whole. Massive congratulations are in order for the team behind Luminous Streets and The Edge of Us – we can't wait to see what the come up with next. If you're in the area, the light galleries are on display every evening from sunset until Friday April 14. All photos in this post by Will McRostie.